Eskrima, Arnis and (in the West) Kali are umbrella terms for the traditional martial arts of the Philippines that emphasize weapon-based fighting with sticks, knives and other bladed weapons, and various improvised weapons. It also includes hand-to-hand combat and weapon disarming techniques. Kali is a very sophisticated, highly refined old and indigenous art dating to prehistoric Philippines what`s been developed and practiced for centuries, although until lately, has hardly been known outside the country.It probably started when early Filipinos discovered rattan (a long, tough vine, cut into convenient lengths), could be used as a good striking weapon. Sometimes, Philippine hardwoods bahi’ and kamagong were used, after it was cured and carved into a heavy, hard and sturdy weapon. It is more difficult to find and is expensive, thus the prevalent use of the rattan stick. Eskrima was very popular with the Maharlika or royal blood. It was also practiced by the common folk. It was a game, sport, physical exercise and an art of self-defense. When Spain colonized the Philippines, kali or eskrima was already the standard fighting art of the Philippines. 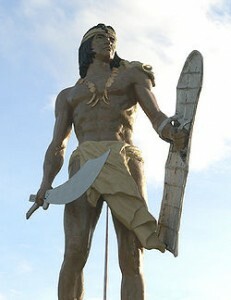 Rajah Lapulapu, ruler of Mactan was a kali expert according to Pigafetta, Magellan’s historian and chronicler. According to legend, Lapulapu used eskrima to route the invading Spaniards eventually killing Ferdinand Magellan. This was the first recorded Filipino repulse of foreign invaders. 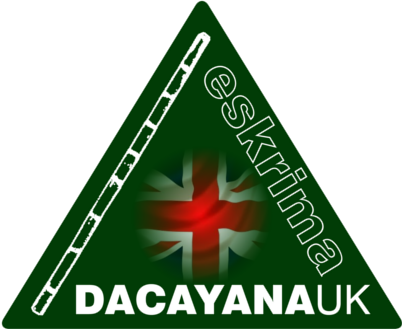 When the Spaniards returned to overcome the Filipinos with their superior firepower, eskrima became a prohibited art in 1596 and 1764. It was totally banned by Don Simon Aredo y Salazar since it was discovered that masters of the art led revolting Filipinos. It was also said that Filipinos were abandoning their farms to practice eskrima. Besides, the practice often led to injury and death. The art went underground and was taught by Filipinos – often from father to son. It also crept into religious ceremonial dances (sinawali) and in Moro-Moro plays, depicting the conflict between Christians and pagans. The sinawali dances concealed moves of offense and defence as in katas so that moves could not be forgotten. Besides sticks, bows and arrows, the early Filipinos were experts in bladed weapons. This was especially true in Southern Philippines, which has influence from Indonesia and more remotely from Thailand and Malaysia. The Muslims in Southern Philippines have a remarkable history of victories against foreign invaders, including Spaniards, Americans and Japanese. The .45 caliber pistol was invented to stop the juramentados during the Moro-Rebellion during the Philippine-American War. 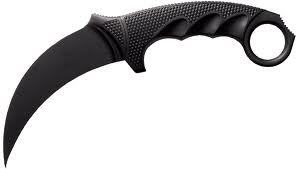 In recent years, there has been increased interest in kali for its usefulness when defending against knives and other street encounters. (Today there are said to be almost as many Filipino fighting styles as there are islands in the Philippines. With regards to its spread outside the Philippines, kali was brought to Hawaii and California as far back as the 1920s by Filipino migrant workers. Its teaching was kept strictly within Filipino communities until the late 1960s when masters such as Angel Cabales began teaching it to others. Even then, instructors teaching kali in the 1960s and 70s were often reprimanded by their elders for publicly teaching a part of their culture that had been preserved through secrecy. 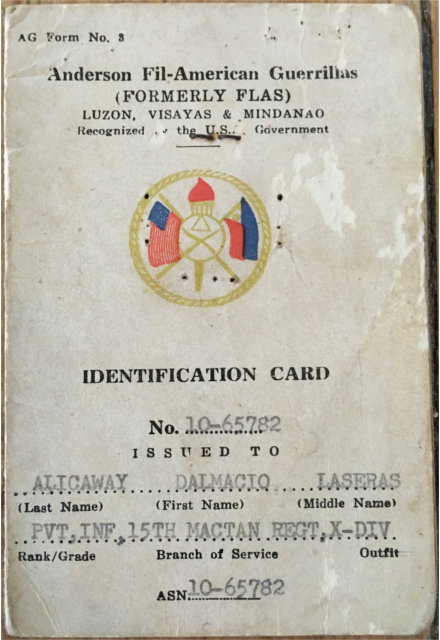 In 1972, the Philippine government included Filipino martial arts into the national sports arena. The Ministry of Education, Culture and Sports also incorporated them into the physical education curriculum for high school and college students. Knowledge of the Filipino fighting skills is mandatory in the Philippine military and police. Usually this involves increased emphasis on locking, controls, and disarms, focusing mainly on aspects of self-defence. However, most styles follow the philosophy that the best defense is a good offense. Modern training methods tend to de-emphasize careful footwork and low stances, stressing the learning of techniques as opposed to more direct (and often lethal) tactics designed to instantly end an encounter. 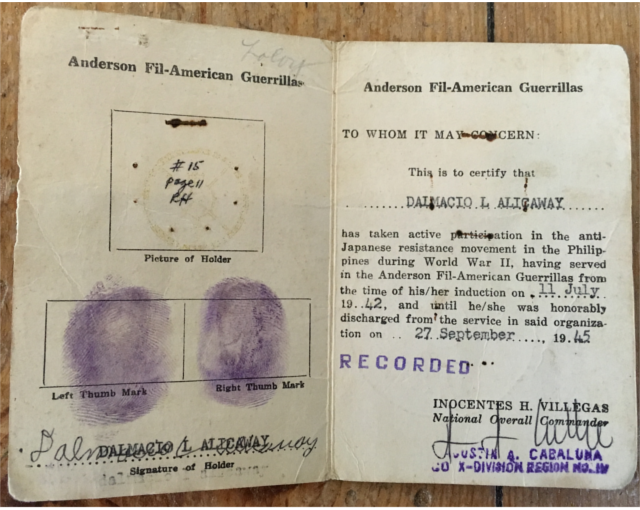 Alberto or ‘Jun’ to his friends began with his studies in Eskrima with his late Grand Father Dalmacio “Enciong” Alicaway at the age of just 8 years old. 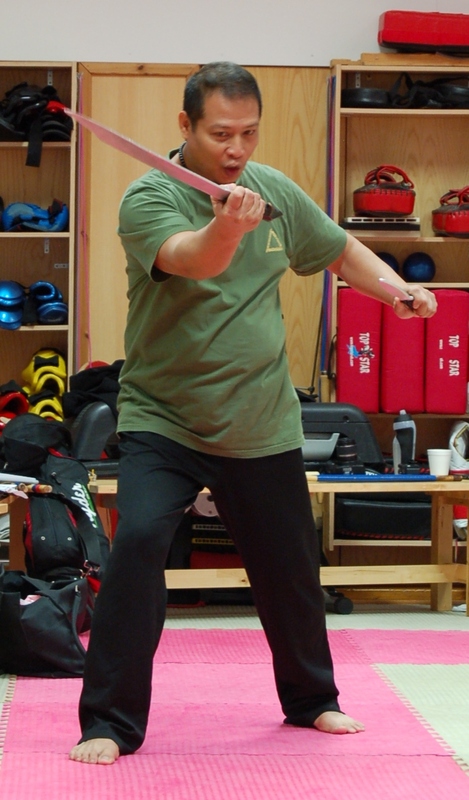 Jun’s Grandfather was not widely known within the world of Eskrima because generally he did not teach outside of the family. His style originated from the island of Negros Occidental and he began to teach Jun because of the youngsters’ interest in Eskrima at this very early age. The style that was passed on incorporated combat knife techniques from the Police Bantok Battallion who were charged with hunting the Japanese Soldiers during the time of occupation of the Philippine Archipelago. Sadly Jun’s Grandfather passed away in 1984. 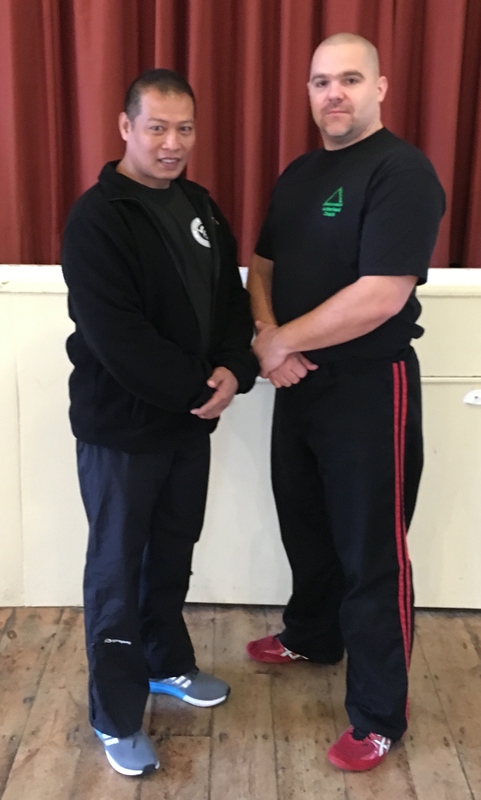 Jun continued his studies under the tutulage of his father’s best friend, Grandmaster Winnie Delarosa who taught Okinawan Karate, he also learnt traditional Tai-Chi under the tutulage of Grandmaster Tan as well as Boxing under the guidance of his uncle Rolando Dacayana. 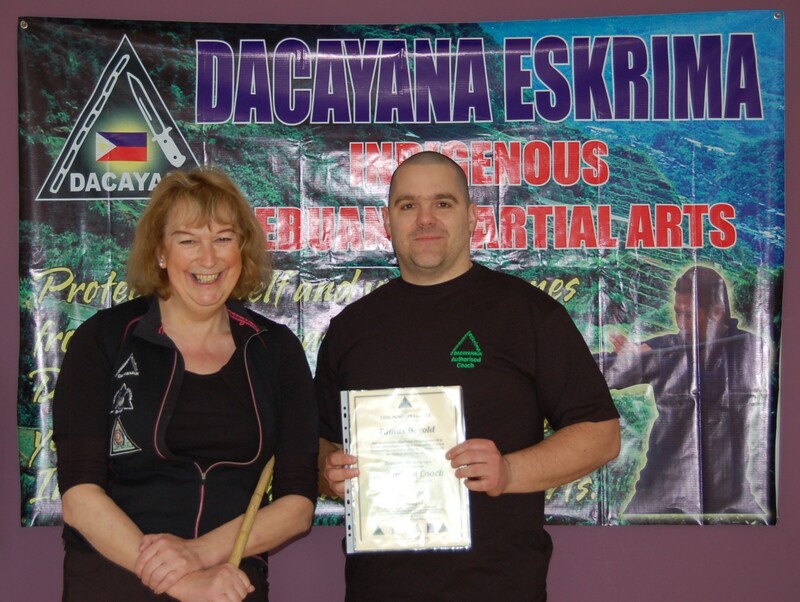 In 1990 Jun continued to develop his training in Eskrima under the direction of his father Grandmaster Alberto Dacayana Sr.
Jun the went on to develop his own style of unique Indigenous Cebuano Martial Arts…eventually to be called the Dacayana Family System.